Do you need to extract text from PDF documents and automatically create new records in Salesforce with the parsed data? Read on, Docparser can do both thanks to our native Salesforce integration. Whether your PDF documents are stored in Salesforce, an email inbox or on your server, Docparser can automatically grab them and extract text from pdf stored in these documents. Don’t limit yourself to using only the Salesforce data loader or manual data entry, Docparser provides an extra level of flexibility and opportunity for text data extraction. Our PDF layout parser allows you to extract nearly any information that you are wanting out of your PDF document, and send it directly to your Salesforce account. Read how to extract text from PDF basics on our Getting Started post. Looking to extract information from reports, purchase orders, invoices, applications, form created PDF’s? Save hours of manual work, get more accurate results, and streamline your workflow with a proven solution counted on by Salesforce users. You can use our native Salesforce integration to send your PDF’s and their contents to your account. Once you have a working layout parser, and are happy with the parsed results, simply go to the integration tab in the app (seen below), and select “Salesforce CRM”. To create your Salesforce integration, connect your account and choose the object which should be created in Salesforce. All default objects (Account, Case, Contact, Lead, Opportunity) are available as well as custom object created by the user (please see below). 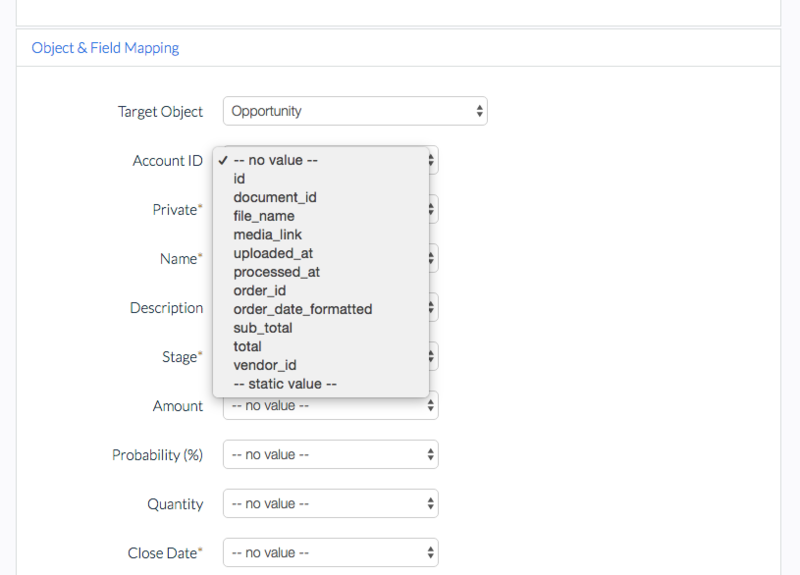 Once you have defined your Target Object, you will have the chance to map your data accordingly with field mapping between the Docparser fields and the Salesforce fields (please see below). Once this is done, the integration is ready to use. Each time we extract text from PDF, for a new PDF, a new record is created in Salesforce, based on your Target Object and mapping selections. What about importing Documents from Salesforce to Docparser? If you are up for coding, the first option is the way to go. Our guide on how to post files from Apex will probably be very helpful to you. If you want to import documents from Salesforce without coding, check out our integration partners Zapier, Workato or MS Flow. All of them allow you to automatically fetch documents from Salesforce and import them into Docparser. Have questions? Contact us for your PDF to Salesforce needs. Can I parse line items from a PDF form into Opportunity Products (OpportunityLineItem table)? Hi David! Our Salesforce integration allows you to create one Opportunity for each table row you parsed. Unfortunately it doesn’t allow you to create one Opportunity with N line item rows. You can do this though by using one of our integration partner platforms (Zapier, Workato, Stamplay, MS Flow). Can it go to existing SFDC records? Record exists in SFDC then the PDF document is updated, information would need to be updated to the existing SFDC record. Hi Dwayne, thanks for the question! Our built-in Salesforce integration only allows you to create a new record. It should be possible however to update an existing record either by using one of our integration partner platforms (e.g. Zapier, MS Flow, Workato, Stamplay) or by using Apex in combination with our API. Hi, Do you have this as Salesforce App Exchange product? Hi Bala! Great question. Docparser is not listed in App Exchange at this point in time. Our sister-app Mailparser is listed though and we might be able to add Docparser to AppExchange as well soon. Please note that you can still use our Docparser > Salesforce integration with a single click. You just need to connect your Salesforce account inside Docparser to get started.